This Thursday is the summer solstice, that enchanting day each year when sunlight reigns supreme and nighttime almost seems like an afterthought. It is the longest day and shortest night in the Northern Hemisphere and traditionally considered the first day of summer – even if it has felt like summer for a while now. The 2018 summer solstice occurs at 6:07 a.m. on June 21. Whether it is your first time learning about the solstice or you are looking for a refresher, here are five things you need to know. 1. What happens on the solstice? 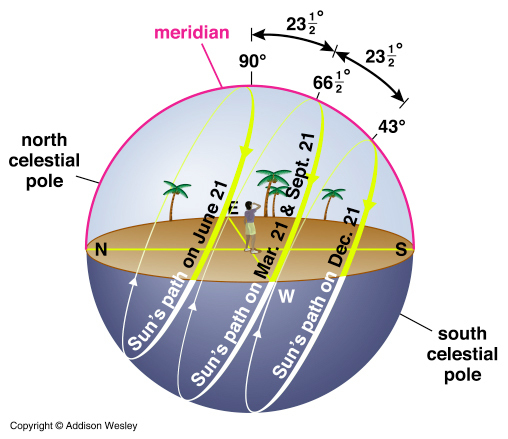 The June solstice marks the exact moment when the sun’s direct rays reach as far north as they ever get, appearing straight overhead along the Tropic of Cancer, at 23.5 degrees north latitude. As a result, we see the sun take its highest and longest path through the sky. 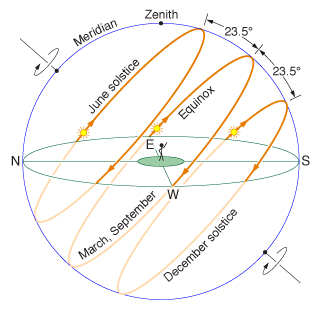 The reason we have solstices, and seasons, is because the Earth is tilted on its axis by about 23.5 degrees. This causes each hemisphere to receive different amounts of sunlight throughout the year. In June, the Northern Hemisphere is at its greatest tilt toward the sun, bringing us more direct sunlight and warmer temperatures. It’s the opposite south of the equator, where June 21 marks the shortest day of the year. 2. How many hours of daylight do we see? The amount of daylight you will see on the solstice depends on your latitude, or distance from the equator. Washington, D.C., enjoys 14 hours and 54 minutes of daylight on June 21, with sunrise at 5:43 a.m. and sunset at 8:37 p.m. That is about 5½ hours more daylight than we see on the winter solstice in December. This map by Alaska-based climatologist Brian Brettschneider shows the number of daylight hours across North America on the longest day of the year – from 24 hours north of the Arctic Circle to less than 14 hours in southern Florida. 3. Is the solstice the latest sunset of the year? Not exactly. June 21 has the longest daylight period in the Northern Hemisphere, but in many places the latest sunset occurs several days later. Similarly, the earliest sunrise is usually about week before the solstice. This astronomical quirk is due to Earth’s tilt and the fact we do not orbit the sun in a perfect circle. Calculated down to the second, the D.C. area’s earliest sunrise (5:42 a.m.) was on June 13, while the latest sunset (8:38 p.m.) is not until June 27. The closer you are to the North Pole, the closer the earliest sunrise and latest sunset occur to the solstice. 4. Why is the solstice not the hottest day of the year? Although the Northern Hemisphere gets its most direct sunlight on the June solstice, the hottest day of summer does not usually arrive until July or August. That is because for several more weeks the amount of solar energy arriving at the ground is greater than the amount leaving the earth. This seasonal lag is largely driven by the oceans, which take a lot longer than land to warm up and cool down and release heat slowly over time. This map shows when the highest temperature of the year occurs, on average, across North America. In general, peak heat usually arrives in mid-to-late July along the East Coast, but not until August along much of the West Coast and areas near the Gulf of Mexico. Both Alaska and the desert Southwest typically experience their warmest days much closer to the solstice, usually in early July or even June. Proximity to water and prevailing wind direction are key factors that determine when summer heat peaks. 5. What’s the deal with Stonehenge? Humans throughout history have celebrated the solstices with rituals such as bonfires and ceremonial dances to mark the passage of the seasons. Some ancient cultures, such as the Maya or the Aztecs, even built special monuments to mark the sun’s changing path in the sky. Stonehenge, which was built more than 5,000 years ago in modern-day England, is perhaps the best known of these prehistoric landmarks. Some historians think the large circle of free-standing stones was once a solar calendar used to track the seasons. That is because on the summer solstice, the rising sun aligns perfectly with the structure’s Heel Stone, positioned outside the structure’s main circle. Nowadays, thousands of people flock to Stonehenge each year to celebrate the solstices and equinoxes, many of them decked out in traditional pagan garb. Of course, if dancing around a bonfire is not exactly your thing, you can still mark the solstice in your own way. Take an evening sunset stroll and watch the sun’s light linger in the northwest sky on our longest day of the year.